Having just taken my solemn vows to the priesthood, I’ve been reflecting on being called, on how God calls us all to more than we are, to live into our gifts for God’s kingdom. My reflection has taken me back down the road which I traveled to get here. Along the way, I spent years finding reason not to follow God’s call. Through it all, I consistently recorded my thoughts through writing in my journals and writing poetry. So I am revisiting some of that writing. This is a poem I wrote many years ago, as I was wrestling with God and with my future, with the many years spent turning aside from the deep call of ministry. I started discernment shortly after this time. 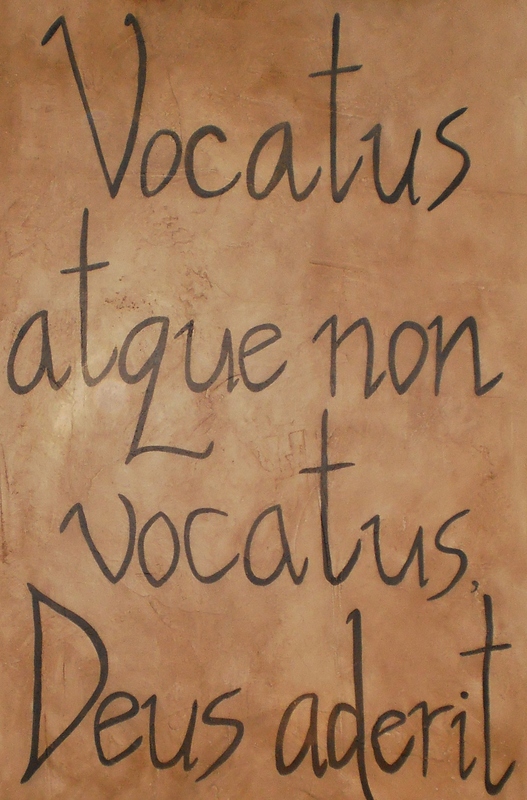 For me, vocatus is God calling, God present, God inviting and luring. Like Jung’s insight about approaching God, the journey to discover our charisms is perhaps one of the central tasks in our life in God. We begin by listening, for God’s call begins with silence, with creating space in which to hear. In hearing the call we begin to enter wisdom; we enter the Mysteries. Listen…what is God calling’s to you? my mind wanders here and there. but growing upward toward open sky. New horizons pull me to the blue. into two arches reaching skyward and sometimes weighing each other down. to the green grass below. How can I resist growth and yearn for it at the same time? settling at the roots and ignoring the sun that always calls my name. of living into who I am and am to be. toward myself, toward the world. The holding back is hurting me now.